One of the more interesting items in the Marshall Islands INDC announcement of climate targets in the leadup to the Paris 2015 COP21 climate conference, is the nation's interest in developing and hosting Ocean Thermal Energy Conversion (OTEC) technology as part of it's strategy for reducing fossil fuels and transitioning to renewable energy. 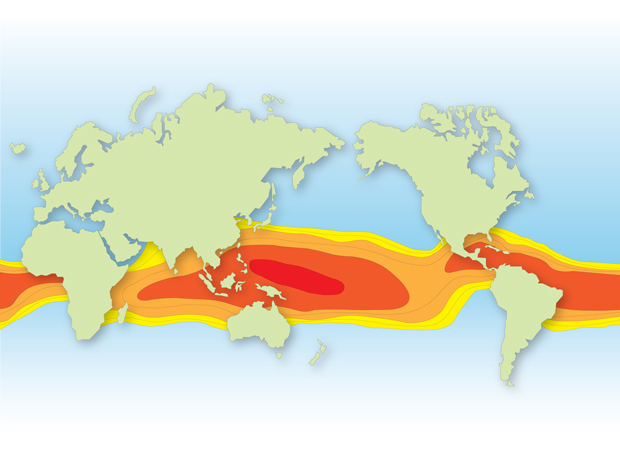 You might ask, what the hell is Ocean Thermal Energy Conversion (OTEC)? It is a technology for extracting renewable energy from the ocean temperature differential between the sea surface and ocean depths of 1,000 metres or more. It works best where there is a large temperature differential of 20 degrees Celsius or more between the sea surface and ocean depths, so the technology is limited to equatorial latitudes from about 20 degrees North to 20 degrees South. Power plants can either be land-based or floating platforms. The technology is pollution free providing baseload 24/7 power using a heat exchanger and turbine to extract power from the temperature differential between the sea surface and the deep ocean. Remote island nations where most fossil fuels need to be imported will particularly benefit as the power it displaces will also result in a substantial economic saving. For example, the cost of importing petroleum based fossil fuels for the Marshall Islands amounted to USD 40.7 million in 2009, or 26 per cent of the nation's GDP. Of those petroleum based products, roughly 69 percent were for the land transport sector and 27 percent for the electricity sector. An OTEC power station of 20-30MW capacity supplemented by other renewables could effectively replace the existing 2 diesel powered power stations (Facilities details) at the capitol of Majuro run by the Marshalls Energy Company. Unlike solar and wind which are intermittent renewable energy sources, OTEC plants have a high energy production capacity factor (see wikipedia) estimated by IRENA of 90 to 95 per cent able to provide baseload power. According to US Energy Information Administration data annual capacity in 2014 for wind was 33.9 per cent, solar photovoltaic was 27.8 per cent, and solar thermal 19.5 per cent. "The idea of Ocean Thermal Energy Conversion is not new. In 1881, eleven years after Jules Verne wrote Twenty Thousand Leagues Under the Sea, the French physicist, Jacques-Arsene d’Arsonval, suggested running a heat engine using the temperature gradients in the tropical oceans. In 1930 one of d’Arsonval’s students constructed the first ever OTEC plant in Cuba, which produced 22 kW of electricity. Very much later, in 1979, the United States Natural Energy Laboratory constructed an OTEC system on a vessel moored off the coast of Hawaii, which produced enough electricity to power the ship’s lights, computers and television. Then in 1999 they tested a 250 kW closed-cycle OTEC plant. Since then the USA has ceased work on OTEC. Interest in OTEC has waned although the Indian government is constructing a one megawatt OTEC plant, and some other governments have expressed interest." Georges Claude was Jacques-Arsene d’Arsonval student. Read about Georges Claude in Eleven days in Cuba. 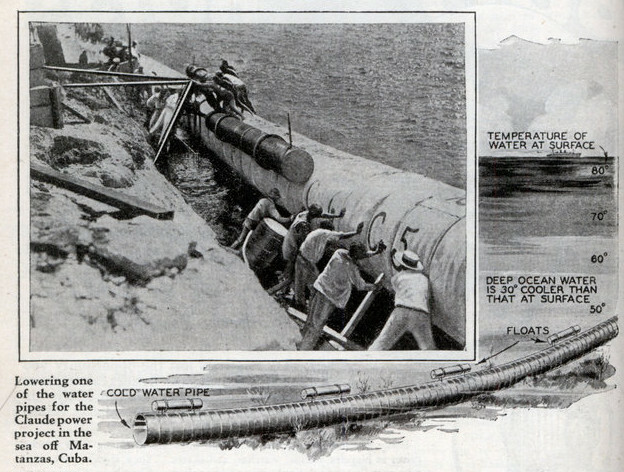 You can delve into a contemporary article about Georges Claude and his pilot OTEC plant at Matanzas, Cuba in the article Harnessing the Power of the Sun in Modern Mechanix, December 1930. The 1970's oil crisis caused interest in OTEC technology to surge with substantial research and development funding by the United States and elsewhere. Demonstration plants were built in Hawaii, with Mini-OTEC a closed-cycle system mounted on a U.S. Navy barge a few kilometres off the coast of Hawaii that produced about 15kW net power. 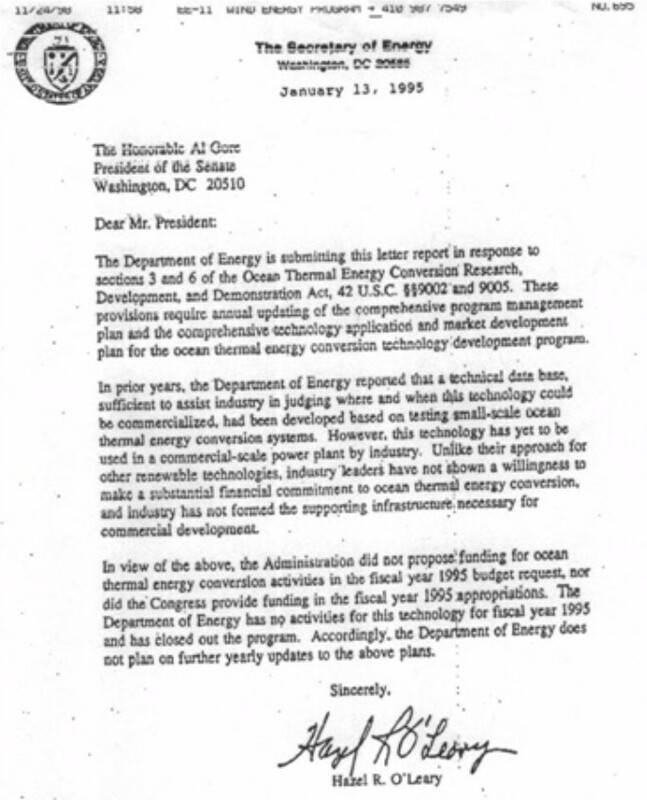 US Federal funding for the OTEC program dried up during the Reagan administration when oil prices had fallen and stabilized. Federal funding for OTEC development and commercialisation was abandoned in 1995, although research continued being funded from other sources on Hawaii. In 1999 the Natural Energy Laboratory of Hawaii Authority (NELHA) created and tested a 250-kilowatt plant. A commercial-scale OTEC plant up to 100MW is on the drawing boards for Hawaii, but development plans were recently shelved, according to a June 2015 report in Pacific Business News, due in part to continued low fossil fuel pricing and the inroads that solar and wind are already making to the Hawaiian energy grid. The technology was further developed to pilot stage with a 20kW plant in South Korea and 50kW plant in Japan during the 1980s. Research in India was undertaken into OTEC from 1980 with an initial plan to build a 20MW station in Tamil Nadu. After two decades a 1MW floating station project was formulated. "...Lakshadweep was identified as the most suitable for setting up of the LTTD technology on experimental basis to produce freshwater. Also, for most islands here, a 400m depth is available within 600 to 800 m from the shore. 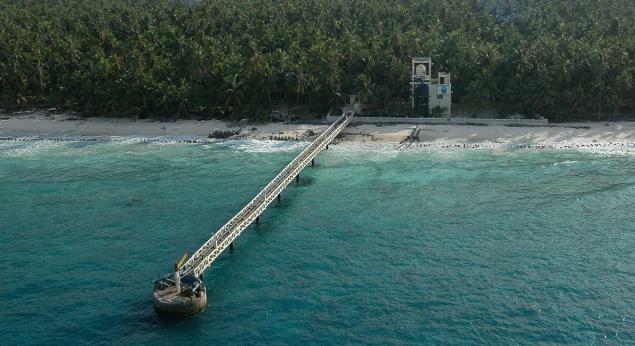 The Ministry of Earth Sciences through the National Institute of Ocean Technology (NIOT) decided to set up a desalination plant at Kavaratti, with a capacity of 1 lakh litres/day in 2005 to provide potable water from the sea and alleviate the scarcity of drinking water faced by the communities. The plant is being operated by local islanders since 2006 and meeting the drinking water requirements of the 10,000 strong local communities for over six years. Studies conducted by a team of doctors have shown an improvement in public health among the beneficiaries with a drastic drop in the water borne diseases." According to a 2013 report in the New Indian Express four Low Temperature Thermal Desalination (LTTD) plants have been successfully commissioned in in India at Kavaratti (2005), Minicoy (2011), Agatti (2011) islands of Lakshadweep, and at North Chennai Thermal Power Station (NCTPS), Chennai (2008). The capacity of each of these LTTD plants is one thousand litres of potable water per day, without the environmental impact of producing strong brine solution of traditional desalination plants. Using OTEC technology for low temperature thermal desalination reduces ecological impact, while it uses more power to run than the Reverse osmosis desalination process. This March 2014 article discusses and compares the various desalination processes. I wonder if OTEC power generation was incorporated in the design, if this would substantially reduce power consumption? It draws upon research article by R. Venkatesan titled Comparison between LTTD and RO process of sea-water desalination: an integrated economic, environmental and ecological framework (PDF). A trial production of OTEC power generation was undertaken in January 2008 at Kulasekarapattinam near Tiruchendur in Tuticorin district of Tamil Nadu, according to a Times of India report. The 2014 IRENA report says this project was commenced in 2000, but not completed due to problems with the pipes for pumping the seawater. France developed a preliminary assessment for a 5MW power station near Tahiti in the 1980s, but the project appears to have been abandoned. more recently, testing of technology components has been undertaken at La Reunion in the Indian Ocean, although not involving cold seawater circulation as yet. Construction of a 10MW pilot plant at Martinique is due for completion in 2018 at a cost of 36 billion francs (about 150 million euros). According to a 2013 report by OTEC news, "This project will have a nominal installed capacity of 14 MW and a net power of 9.5 MW generated in an ammonia closed loop Rankine cycle with four turbo-generators. The inlet pipe is a 6 meter diameter riser spanning 1.1 kilometers in depth. Unfortunately this project suffers from delays due to the weak returns from the sale of carbon emission permits under the European Commission’s NER300 financing package." Polynesia may also have an OTEC plant constructed with Sylvain Mullenheim from French military and industrial group DCNS visiting Polynesia for talks on ocean renewable energy, according to this June 2015 youtube video and report (in French). The proposed station may have a capacity of 10MW to 20MW, with the aim to train a local workforce who would then be able to export their expertise. There are several proposed projects for around the Caribbean, including the French territory of Martinique (above), the Bahamas, Barbados, US Virgin Islands, the Cayman Islands, and Puerto Rico. The Caribbean island of Curaçao, administered by the Netherlands, have embarked on development of a 500kW OTEC demonstration plant, according to this 2012 MOU for a long term power purchase agreement. The company involved, Bluerise, said in a 2014 feasibility study that a 10MW plant was technically feasible and economically justifiable. Lockheed Martin signed a contract in 2013 to build a 10MW plant off China's Hainan Island ready by 2017 to supply power to a luxury resort. The International Renewable Energy Agency (IRENA) released a technology brief (PDF) on Ocean Thermal Energy Conversion in June 2014 which reviews the technology, performance and costs, potential and barriers. The IRENA study says "OTEC seems most suitable, and economically viable for island countries and remote island states in tropical seas where generation can be combined with other functions, as e.g., air-conditioning and fresh water production." Maybe I'm painting too rosy a picture here. There will be environmental impacts from such a power station that may require resolving. 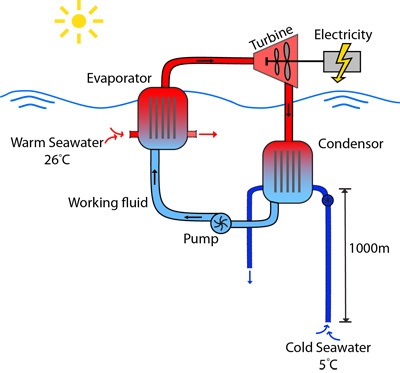 To produce the power enormous volumes of seawater need to be pumped through the power station. A 10MW power station would require a 4 to 7 metre intake pipe for a flow of water of approximately 100,000 cubic metres per hour, while a 100MW station the intake might be of 10 or more metres width and even greater flow volume. Pumping large volumes of water may produce impacts on marine life at the seabed due to the large scale upward transfer of cold water with high nutrients content, and discharge of this colder water after using it for cooling purposes at a higher depth closer to the surface. Fencing and filtering intakes may need to occurr to prevent fish and other larger species entrapment. The Marshall Islands is ideally suited to this technology being located in the tropics just 7 degrees north of the equator, with deepwater close to shore that provides a stable water temperature differential of up to 24 degrees Celsius. In fact the Marshall Islands is located at one of the best sites for maximum temperature differential on the planet, allowing up to 30 per cent greater operating efficiency than the OTEC pilot plants tested in the seas near Hawaii. Initial interest in this technology in the Marshall Islands occurred in 2009 in regard to development of a 10 MW OTEC plant which would also produce 2 million gallons/day freshwater. In 2012 energy experts from Japan briefed Marshall Islands President Christopher Loeak and his Cabinet on this technology. According to Giles Parkinson writing in August 2013 - Atoll nations at cutting edge of climate and clean energy - the Marshall Islands Foreign Affairs Minister Tony De Brum believes a 20-30MW plant could be in operation before the end of the decade making the nation largely energy self-sufficient and earning income through a power supply agreement with the large US military base the nation hosts. Marshall Islands Foreign Minister told the Guardian in November 2013, "We're exploring OTEC production. We have a grant from the World Bank, and we want to build an OTEC plant to provide electricity below 25 (US) cents, maybe as low as 16 cents, per kilowatt. It's a new technology, but that's what we need. Eventually we want to produce hydrogen for export. We want to turn around our dependence on petroleum." The Marshall Islands is one of a group of eight small island countries that export 54 per cent of the world's raw tuna. De Brum said "That's a huge economic bundle that can make our countries prepared for eventualities. In order to exploit that, we need power and water. We can get power from OTEC, which will help our fish exports and will probably make us exporters of energy in a decade or two." If the Marshall Islands is to develop their ocean thermal energy potential, they will need substantial support internationally to bring this project to fruition. There are a handful of private companies that have developed some expertise in this technology, including: Bell Pirie Power Corp., Bluerise Delft, DCNS France, Energy Island Ltd., Lockheed Martin, Offshore Infrastructure Associates, Inc., Ocean Thermal Energy Cooperation, OTEC International, SBM Offshore, and Xenesys. While the promise of ocean thermal energy remains, the large up front costs involved in development of commercial scale facilities remains a stumbling block for private corporations to develop without additional low interest financing support, according to this report by Mark Stricherz from December 2014. Once initial 10MW commercial scale plants are in operation, we are likely to see this technology rolled out further and benefit from economies of scale with operation of larger sized power stations in the range of 50MW to 100Mw.